The 2017 Edelman Trust Barometer confirms that trust is in crisis around the world. The general population’s trust in all four key institutions — business, government, NGOs, and media — has declined broadly, a phenomenon not reported since Edelman began tracking trust among this segment in 2012. This does not bode well for corporate brands. When the line (or should it be a wall?) between #fakenews and #realnews disappears, and we can’t tell the difference between them, we are creating a reality in which the meaning of the brand dissolves into chaos. What do I mean by this? I mean that in a world where the marketing of lies becomes the norm, everyone loses – the consumer, the brand, the business, and the future of society itself becomes cloudy. As a corporate leader, the one area in this murky landscape that you can influence directly is your own company’s trust level with stakeholders. In fact, it’s imperative that you get ahead of that gap sooner rather than later, because it is growing. More and more of your constituents expect companies to expand their corporate mandate and to care for the wellbeing of the web of life. “Do no harm” was yesterday’s standard for corporate citizenship. As alarm rises in global populations over issues that transcend governmental jurisdictions — such as environmental threats, and food and water supply problems — corporations will be held accountable for their contribution to those problems. On a more subtle level, the opportunity to stand out as an authentic category leader is diminishing with time. As millennials assert their values in the marketplace, the opportunities to be the preferred brand in your category will depend on how quickly you authentically embrace the broader good. We’ve been taught that the “brand is a promise to the customer,” and how you deliver on that promise is how customers will experience and judge your brand. As I pointed out many years ago, because your brand is part promise—and part delivery on that promise, your company must not only communicate its vision to its customers; it must live it, every day, as an organization. Promise and delivery must house the same message, or the brand is empty. As I mentioned earlier, trust in corporations is already quite tenuous. And so, what you say via corporate communications is not trusted. Worse, what swirls around social media controls the narrative about your brand. Finding purchase on this slippery slope requires vigilance and discipline. focus resources efficiently on what will make the difference to restore stakeholders’ faith in your word and preference in their choices. That’s a necessary practice if you are to restore and maintain goodwill in the marketplace. But it’s not enough to sustain a thriving relationship. That’s because the trust gap between business and society is actually a moving target today. So, it’s critical to go beyond the simple mechanics of credibility, of calibrating what the company delivers with what it promises. You’ll need to elevate the very promise of your brand as a global citizen in order to meet the emergent expectations of business as a trustworthy institution. Today, the pressure is on to be more than a trustworthy traditional company who maximizes shareholder value. Your company is expected to go beyond excellent commercial performance and credible branding, to actually being an activist among peers. Each leader today is expected to play a uniquely meaningful role in society, to take care of the Web of Life with its own unique competences — while being financially profitable. Some examples of such leaders who have successfully leapt into that next league of corporate brand value are featured in this video. It’s a daunting task for the traditional C-Suite until you look at it through the lens of the new, self-generating model of management. 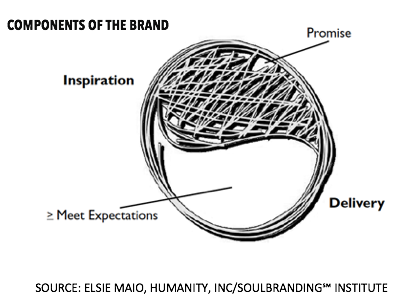 So why is it so difficult to deliver on the brand promise? One reason is that although corporate communications, marketing and creative professionals can make an inspiring brand promise, and do all the time, they do not have the clout to make it come true. (Ask the swinging-door CMOs.) And they might not even be in communication with the parts of the organization who are responsible for delivering products, services etc. In our work, we find that this void in C-Suite accountability and authority is at the heart of the persistent trust gap. That becomes apparent when you look at the three types of gaps that distort brand value. If the source of brand value is cross-functional, cross-unit, and cross-stakeholder, who but the one with cross-functional clout can effectively orchestrate the corporate brand? Gap # 3: Not delivering on crucial aspect(s) of the right promise. Once you have a sense of which of those three gaps (or combination) is a problem for your company, you can begin to look for the source of the gap. coordinate the contributions and timing of the many functions, business units and resources that shape the brand promise and stakeholders’ experience of delivery (organizational structure, empowerment, incentives). The goal is to maintain a harmonious back and forth, virtuous circular flow between brand expectations and brand experience. That dynamic is what makes participating with it exciting or at least inspiring. Don’t underpromise or your offering is just a functional solution; don’t overpromise or you’ve strained trust. In my previous post, I mentioned the CEO must align operations with values. Most all businesses are grasping to bridge the double chasm to stakeholder trust and sustained commercial relevance. Individuals are scrambling, too, for an immediate toehold on their livelihood, and some insight into how to thrive in the future. The answer is not to invest in incremental gestures like cause-marketing, or by simply complying with the standards your peers set for good citizenship. The answer is to transform your system. Reimagine what’s possible for your business with your people fully engaged. 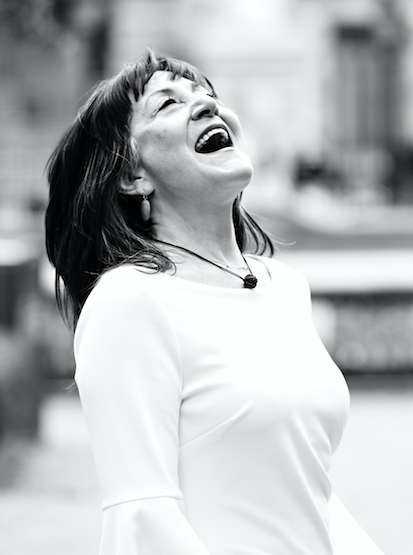 Unleash the higher angels on your team: cultivate the human values that move your employees to innovate with the joy of doing the right thing for the business, for society, and for their own full expression as social beings. And then support them with your personal passion to lead a corporation that thrives in service to humanity. This is the ongoing challenge in every industry going forward: rebuild trust. Without it, we erode our future. Her firm – Humanity, Inc is the successor company to Maio & Co, which emerged in 1994, born from three consulting disciplines: business strategy, brand strategy and values-led operations. Humanity, Inc., SoulBrandSM, SoulBrandingSM, Being the BrandSM are service marks of Humanity, Inc. 1997-2017.